Column Climber CC02X Combo The ultimate combo for vertical mobility while maintaining 100% tie-off and 2 ft fall arrest at all times. Column Climber™ patented design provides unmatched mobility, as an access device, and unparalleled convenience as a personal work platform at every work point. Includes our our patent pending Column Claw™ and T-Lanyard. 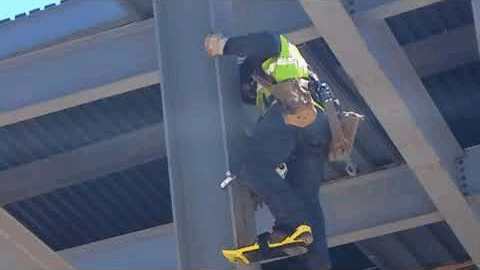 The Column Climber is a simple-to-use device that allows workers to safely and effortlessly climb up, climb down, and work right from a steel column at the connection point. Column Climber is classified as both an access device and a personal ‘work platform’. Workers can finally safely and comfortably work with two hands free, positioning themselves correctly to connect, bolt-up, weld, or inspect, while increasing productivity and lowering equipment/rental costs.